But see Harry Jack's reservations! This great railway is treated in three files: the first herein covers the general history and those great engineers (Bury, McConnell and Francis Trevithick) who came before Ramsbottom and Webb (who demand a separate file for their activities) and finally the period under three lesser mortals: Whale and Bowen Cooke and Beames. It may be noted that the 0-8-0 type instigated under Webb may ultimately demand its own file as some remained in service virtually until the end of steam: the sight and wheezing sound of one of these working empty passenger stock or long freights climbing through Saddleworth towards Standedge remains one of the most enduring of personal memories. The North London Railway is treated separately. This railway claimed with considerable justification to be the Premier Line. It linked London with Liverpool, Manchester, Preston and Birmingham. When Ireland formed an integral part of the United Kingdom, and many of its citizens were seeking to break this link, the Premier Line was perceived as an essential element in maintaining rapid communication with Dublin. Its main line to Carlisle formed the major part of the West Coast route to Scotland. The Crewe Works policy of standardization ensured that the large locomotive stock was restricted to comparatively few types. Nock has produced several studies of locomotive development, but it should be noted that his London & North Western Railway (1960) is not a mechanical history. When Jones produced his Steam locomotive development this great railway lacked a great railway history, but this has since been written by Malcolm Reed. Although Malcolm Reed's work is not a mechanical history it does provide insights into the management of the railway which influenced the path of locomotive development. Brian Reed produced a history of Crewe Works and a history of the Crewe to Carlisle line (the latter demanded great engineering perception as the line was taken through demanding country without any prospect of local traffic). The grandeur of the result is probably best perceived from being a passenger on the adjoining motorway where the dramatic changes in altitude can best be appreciated. The North London Railway, which was worked by the LNWR between 1908 and 1923, is introduced as a sub-section. The Lancashire & Yorkshire Railway is treated separately. Sadly, the once great railway was treated with contempt by the Midland Railway biased management of the LMS. There was a great renaissance following electrification in the late 1960s. In the early days of the LNWR locomotive policy was divided between Wolverton (Southern Division) and Crewe (Northern Division). The RCTS has produced a history of the former Division by Harry Jack. This is literally a heavy tome which attempts to record all that happened at Wolverton under the aegis of Edward Bury and James McConnell. The Introduction clearly states the difficulty of the task as records are far from complete and there is a considerable body of incorrect information stemming from Charles Stretton's publications. It is not surprising that the locomotive affairs of the company were managed by great men, notably Ramsbottom, Webb and Bowen Cooke, and that some of the greatest locomotive engineers, notably Gresley, were ex-Crewe men. lnwr.org.uk is appropriately a website worthy of the Premier Line. It is beautifully constructed and unlike many websites is rich in information: the current exhibition of goods locomotives is a model of access to information which is otherwise difficult to find. Barrie, D.S. [M.] The locomotives of the L.N.W.R., 1897-1922. Part VI The "Claughton" 4-6-0's. Rly Mag., 1937, 81, 278-86. 11 illus., 2 tables. The previous five parts were by O.S. Nock (below). Dorman, C.C., compiler. North Western album. London, Ian Allan, 1965. 100 p. 94 illus. Illustrations. Harris, W.L. Crewe locomotives, 1845-1924. Rly Obsr, 1934, 6, 4-6; 29-30; 34-5; 58-9; 89-90; 103-5: 1935, 7, 191-3; 230-2. 16 tables. Livesay, H.F.F. The locomotives of the L.N.W.R. London, Railway Publishing Co., 1948. 100p. 36 illus., 31 tables. A chronological record. Ottley 6370. Locomotives and motive power. Rly Gaz., 1938, 67. Supplement (16/9/1938): 66-81. 25 illus., 39 diagrs. Survey of LNWR motive power to mark the centenary of the London & Birmingham Railway. Locomotives built at Crewe Works. J. Stephenson Loco. Soc., 1953, 29, 21-3; 231-4, 247-9; 273-5; 323-5; 365-6: 1954, 30, 14-16; 111-12; 204-5; 344-6; 416:1955, 31, 15-18: 1958, 34, 59-60. A works list. Errata (C. Williams). 1954, 30,341-2. Nock, O.S. The locomotives of the L.N.W.R., 1897-1922. Rly Mag., 1936, 79,113-20; 186-95; 337-45: 1937, 80, 121-6; 194-8.33 illus., diagr., 20 tables. The final part is by D.S.M. Barrie (above). Nock, O.S. The L.N.W.R. Precursor family: the Precursors, Experiments, Georges, Princes of the London & North Western Railway. Newton Abbot (Devon), David & Charles, 1966. Nock, O.S. The premier line: the story of London & North Western locomotives. London, Ian Allan, 1952. The period 1900-1923 occupies about half of the total content. Later printings omitted the coloured illustrations. Reed, Brian. Crewe locomotive works and its men. Newton Abbot: David & Charles, 1982. Includes excellent short biographies of the major engineers associated with Crewe Works. Reed, Brian. Crewe to Carlisle. London: Ian Allan, 1969. Bibliography [company minutes consulted]. List of Parliamentary Acts. Reed, Malcolm C. The London & North Western Railway: a history. Penryn: Atlantic. 1996. 248pp. Spencer-Yeates, F. Built at Crewe. Rly Wld, 1959, 20, 127-39; 218-25; 276-80; 324-9; 455-61; 676-80. 26 illus. A list of locomotives extant in 1923. Rutherford, Michael. 'Premier Line' - 150 years. (Provocations)[Railway Reflections No. 23]. Backtrack,. 10, 622-30. Talbot, Edward An illustrated history of LNWR engines. Shepperton: Oxford Publishing, 1985. 333pp. 152 figs., 519 illus. Williams, C. A register of all the locomotives now in use on the London & North Western Railway. Crewe, 1912. 67pp. See Ottley 6595 and 6594 (latter lists named engines only). Ottley notes that first edition was in 1899 and that there ws a supplement with addenda and corriegenda in 1918. Might have been thought that "black would be simple", but there is an extensive literature and the period prior to black is one of deep controversy: See Jack's contribution to Southern Division liveries..
Key source of information. Reviewed by Gerry Beale in Br. Rly J., 1986, 2, 88: "lavishly produced book": very well received. Talbot, Edward The locomotive livery of the LNWR  some problems. Edward Talbot. Br. Rly J., 1986, 2, (11) 56-7. Talbot considers the frame colours (black predominated but the first ten Precursors had red frames as an experiment. The colour of the cab interior is also considered and seems to have been varnished "grained oak", "dirty putty" or several shades of red. No. 5000 Coronation had a special livery and the cab of it was painted Indian red. Bull, James. The Southern Division Engines of the L&NWR. Locomotive Magazine, April 1897 to April 1898, preliminary articles from January 1897. The ballast engines were used in the construction of the London & Birmingham Railway and subsequently in its maintenance. Initially Robert Stephenson was responsible for these locomotives, but gradually others (Contractors) became involved, notably Thomas Jackson, John Cummings, Cardus & Fawcett and Richard Madigan. Many of the locomotives were ordered by the L&BR. Robert Stephenson was responsible for Stephenson WN 111 and Tayleur WN 18 and for obtaining No. 2 Phoenix from the Leicester & Swannington Railway. In 1836 the Birmingham Committee ordered six from Tayleur, three from each of R. Stephenson, Mather Dixon and Fenton Murray & Jackson. In the same year the London Committee ordered two from Robert Stephenson and two from Tayleur. Jack tabulates the dimensions of the standard ballast engines. Inevitably, a fairly muddled set of new and secondhand locomotives were acquired and Jack charts a way through this collection. Joseph Thornton (contractor) acquired a locomotive from John Jones of Jones & Potts. Daniel Pritchard acquired Liverpool & Manchester Railway 2-2-0 No. 17 Sun. Samuel Hemming, John Chapman and William Hughes were contractors who owned their own locomotives. One of the more improbable ballast locomotives was L&MR No. 28 Caledonian which had been constructed by Galloway, Bowman & Glasgow in Manchester. G. & J. Rennie supplied locomotives. At this stage locomotives were being used as a temporary measure before the winding engine and cable haulage were available. A Robert Stephenson 2-4-0 (WN 153) intended for the Baltimore & Susquehanna Railroad was employed due to the financial failure of the agents G.&A. Ralston. This was a large and powerful locomotive (Jack Fig. 9) possibly named Leviathan. The Bury type is considered by Jack in two main chapters with additional material being contained in further chapters. As the type has been considered differently by others there is a general prefactory section followed by Jack's subdivisions: See also Bury's own paper:Locomotive engines of the London and Birmingham Railway. Proc. Instn Civ. Engrs, 1840, 1, 33. Rutherford, Michael. The Bury influence. (Railway Reflections No. 28). Backtrack, 1997, 11, 205-12. Brief biography of Bury: Rutherford provides strong justification for Bury's use of small locomotives (in particular trains were light). The Bury haystack fireboxes saved having a dome which involved cutting a hole in the boiler plates. Notes the development of the long boiler type with the firebox behind the rear axles. Standardization at the Clarence Foundry was one of his achievements. Led to lengthy letters by Harry Jack concerning the improbable existence of "records" relating to the firm. on page 460 and 689. The former follows from a letters by Hughes (on the lost records) and Martin ( the Bury locomotive under the ocean) on page 340. Rather different view (possibly from the more "imaginative Robin Barnes) on page 576. Yet, another letter on this topic by Rowley (Vol. 12 page 116) on re-assembly of records from published sources. Illus. : Diagram of the first Bury locomotive; Plan of the Clarence Foundry at Liverpool; A 2-2-0 in service on the Lytham branch of the former Preston and Wyre; The A class 0-4-0ST; A Norris advert of 1844 showing the Bury influence; Diagram of a 4-2-0; Diagram of a new 0-4-0ST; Furness railway no 3 Copperknob; Great Southern and Western no 36; LNWR Bloomer No 603; An early 4-6-0 locomotive diagram from the USA; A long boiler 0-6-0 No 1824. Notes that the Bury books were sold on 15 and 16 August 1851; secondly, the advances due to Bury (horizontal cylinders beneath smokebox, crank axle, large coupled wheels) and on page 43 a list of Bury's early engines taken from The Engineer of 18 September 1857. London & Birmingham Railway original engines, 1837-41. As far as possible the further subdivisions follow those of Jack as KPJ from his studies of indexing, both manual and automatic, believes that a good author establishes the correct semantic basis for a subject (and clearly Jack is an author worthy of such trust). Nos. 1-36, 49-52 and Aylebury Railway Nos. 1 & 2. Six were ordered from each of: Mather, Dixon; Benjamin Hick; Peter Rothwell; Haigh Foundry; R.&W. Hawthorn and Edward Bury. Maudslay were late in tendering for a further three and these were ordered from Bury. Nine further locomotives were ordered from Edsward Bury and six from Benjamin Hick plus two further from Hick for the Aylesbury line. The dimensions are tabulated on page 83. There is a line drawing Figure 11 and sectional side & front elevations and plan (Fig. 12). On pp. 84-6 the Bury specification is set out and the extent to which the manufacturers were able, or unable, to meet it are considered. Practice and performance was related to the quality achieved by the builders. Early accidents are assessed on page 88. There is a line drawing Figure 17 and sectional side & front elevations and plan (Fig. 18). Tenders were received from the Bedlington Iron Co. , R.& W. Hawthorn, Peter Rothwell, Thomas Vernon, Benjamin Hick and Edward Bury. Orders were placed with Edward Bury, and Maudslay Sons & Field. The locomotives were supposed to be constructed to specification, but even Maudslay failed to achieve this. Design coincided with abandonment of rope haulage on Camden Incline and much faster trains to Birmingham. Cites James Bell for details of valve gear fitted to Nos. 59 and 60 and 92. 92 and 95 built at Wolverton probably from spare parts. Bury type 91, 50 (formerly 60) and 3 (formerly 26) were sold to the LCDR in 1860/61 and were taken across London by road from Camden to Battersea by Pickfords. No. 50 became Gadfly, 91 Hornet and 26 Wasp: they were not very successful. Nos. 97 and 98 were sold to the Mersey Docks & Harbour Board in April 1864.See also Locomotive Mag., 1901, 6, 138. These were the last to be equiped with large gab valve gear. They had larger boilers and were very similar to the preserved GS&WR No. 36 which is kept at Cork (Figs. 25 and 26). They were more powerful and faster. Nos. 111-116 were 0-4-0 and 117-118 were 0-4-2: the latter were more powerful, but according to Bury the trailing wheels detracted from adhesive weight and increased friction on curves and added to weight to be moved. In 1853 No. 115 was fitted with rubber springs. In 1854/5 Nos 112, 113 and 115 were lent to the North London Railway. No. 113 (as 1175) was sold to Kirk & Parry for work inconstructing the Barking-Upminster-Pitsea line in 1865. No. 117, as 117D was hired to Maxwell of the Redditch Railway in 1859 and was then sold to the Clay Cross Co.
For once the complexity of this type almost defeats Jack and it is fairly difficult to reconcile some of the text with the summary table on page 122. Fig. 27 shows locomotive in original state. : Longridge replaced Jones & Potts for these Stephenson patent 'Mammoth' long-boiler locomotives. James Bull noted the differences between the suppliers. There were complaints about the locomotives in service: "Simply put, the vaunted Stephenson patent six-wheeled goods engines were a disaster" (Jack p. 119). The boiler of Number 140 exploded in December 1856 whilst working on the Leamington branch. Fig 28 shows type as rebuilt with McConnell boiler. Fig. 29 shows ex-131 (LNWR 1135) as West Cornwall Railway Nestor. No. 1107 became Apollo on the same railway and they became GWR 1387/8 in 1876. These reached the WCR via Hunt & Sacré. Two further locomotives of this type reached the West Cornwall Railway by which time the line was being worked by the South Devon Railway. These two had been rebuilt by Ramsbottom and had carried a multitude of numbers: 122>1182>1896> Ceres >GWR 1390 and 126>1186>1864> Cyclops >GWR 1389. No. 137>737>1150? was disposed via Kirk & Parry of Sleaford. No. 127>1127>1193 became a saddle tank named Achilles and worked at Welch Freehold & Iron Co., Briton Ferry. No. 129>729>1171 also became a saddle tank named Queen and worked at Ilkeston Colliery. No. 132>732>1131 was sold without wheels and became a stationary engine called Cotton to work cotton mill machinery. All of these were handled via I.W. Boulton. No. 119 probably went to the Grand Trunk Railway in Canada. (In fairness to Jack: it is worth quoting what he wrote: "Despite the difficulty in identifying individual engines because of renumbering it seems likely that at least one of thse engines went to the Grand Trunk Railway of Canada"). This was probably former 119 (1150) at time of disposal. The other was an ex-SSR locomotive. Fig 30 (photograph) shows rebuilt type on Boulton's siding in 1872/3. Found to be very satisfactory on SD. Converted to saddle tank at Longsight in 1859. Although delivered to, and paid for by the L&BR, the engine was clearly indended for the M&BR. Fig 31 shows No. 31 with tender with rubber springs. The boilers of these two locomotives differed from each other and were larger than standard Sharp singles. Jack dismisses Locomotive Magazine 1897 account that No. 8 was transferred from NE Division. Fig. 32 drawing of No. 9. Ordered 21 January for Huddersfield & Manchester Railway. Fig 34 (drawing). Crewe engines which worked on Southern Division. This section describes the locomotives which were ordered in anticipation of the opening of the Trent Valley Railway which opened as part of the ND, but the locomotives ordered were supplied to the SD. The firebox was of maximum size. Fig. 35 is a drawing of No. 168. No. 168 was possibly sold to the St Helens Railway to become their No. 16 Mersey. Similar to long-boiler 0-6-0. Locomotives had oval boilers. Fig. 36. Found to be "imperfect" with leaky tubes and cracked fireboxes. Works numbers 561-4 had been intended for Trent Valley Railway but were diverted to Eastern Counties Railway between October 1846 and January 1847. Figs. 37 and 38. McConnell fitted "improved stronger framings" to rear of Nos. 153-6 and 158 in 1848. Nos. 153 and 157 were converted to 4-2-2 type in 1849. No. 157 experienced a boiler explosion on 26 March 1850: the safety valves had been deliberately screwed down, but McConnell complained to Stephenson's that boiler had been weakened during construction. Fig. 39. The boiler of No. 164 exploded on 5 April 1855. The safety valve had been screwed down to give a pressure in excess of 200 p.s.i. Fig. 41: photograph of No. 173 at Wingfield station (MR) in 1890. Fig. 42 (phot. ): No. 34 at Shrewsbury Abbey Station (pre-1875) with Potteries, Shrewsbury & North Wales Railway train: locomotive still in LNWR livery. Fig. 42: No. 203 as built. Jones & Potts 4-2-0 passenger engine No. 175: subjected to McConnell experiment for compensating balances to avoid lateral motion due to outside cylinders: sliding block linked to driving crank. Fig 45: phot. No. 189 at Curzon Street Station, Birmingham. Note McConnell patent disc wheels on front axle. Fig 46: No. 190 (drawing). Derailment at Watford on 6 August 1856 involving up Wolverhampton to Euston fast express: criticised by Inspecting Officer for misplaced centre of gravity of lcomotive: only 4ft 1½in in front of rear wheels. Type was banned from working fast trains in Prussia following Götersloh derailment on 21 January 1851. On disposal offered to LCDR but not accepted. No. 185 was probably sold to Benjamin Piercy of Westminster, engineer of the Hoylake and Royal Sardinian Railways. Nasmyth Gaskell 2-2-2 passenger engines, 1847-8. Nos. 191-196. (Jack 146). Intended as 4-2-0 type but changed to 2-2-2 before delivery. Long-boiler type. Not wanted on Southern Division, so placed in store. Sent to Huddersfield & Manchester Railway where not really suitable due to sharp curves and probably restricted to Stockport to Stalybridge section. Fig. 47. Ordered by Leeds, Dewsbury & Manchester Railway whilst line not ready. Two were sold to the Eastern Counties Railway where they became Nos. 115 and 116 (later 215 and 216). They cost £2501.25 each. Four went to the Southern Division. Cites Locomotive Magazine, 1897: wheels were painted red (as with ECR locomotives) and locomotives acquired nickname 'Jenny Red Legs'. Fig. 48. Not really suitable on Southern Division and three were sent to Yorkshire line prior to the opening of Standedge Tunnel. No. 201 used as Camden banker and No. 204 was disposed via Isaac Boulton. See also East Lancashire Railway order. Replacements for locomotives sold to ECR. McConnell found them more suitable than previous locomotives. Fig. 49 No. 208. Jack provides a brief history of the Jenny Lind type, including comment on the boiler pressure: not set at 120 psi whilst working on Southern Division. Bury, Curtis & Kennedy 2-2-2 passenger engines, 1848. Nos. 12, 18, 65, 67, 75, 218. (Jack 149-52). Ordered by Chester & Holyhead Railway. Much fuller technical description by Jack than usual with Figs. 50-2 showing the cylinder layout. They still had bar frames but had an innovative grate which made it easy to drop the fire. Many features were incorporated into the Bloomer design. Nothing like the Stephenson long-boiler type, but derived from Shrewsbury & Birmingham Railway Wrekin supplied by Bury, Curtis & Kennedy in 1849. Description in Tredgold Locomotive engines, 8th Paper, 1850. Dismisses as spurious Stretton drawing published by Science Museum (Jack fails to record where) and in Locomotive Mag., 2, 144. Jack states that "These engines were big and had a distinctive appearance: there was a lot of brightwork on them"
This latter was built by Tulk & Ley and tested on SD where it ran 2300 miles and was then purchased by SER. Fig. 56: drawing. Built Bury, Curtis & Kennedy: Works Number 355. It had an oval-section boiler and a mid-feather firebox. Jack cites for drawings: Tredgold 10th Paper; coloured drawing by E.T. Lane of 20 September 1849, D.K. Clark Railway machinery (1855) and the Catalogue of the Great Exhibition (Exhibit 512). Fig.s 56 and 57. This locom,otive was the earliest to employ the 'cauliflower' device. Described by Pasley in Min. Proc. Instn Civ. Engrs., 1849 April?. Fitted with rubber springs. Figs. 58 & 59. See also Locomotive Mag., 1897, 2, 18. and Fig. 32 page 159. Stephenson 4-2-2 express passenger engines, 1848. No. 233, 234. (Jack 162-4). Figs 60 & 61. Enlargement of Stephenson long-boiler type. According to Ahrons were fitted with midfeather fireboxes. Sharp Bros. 0-6-0 goods engines, Atlas type, 1847, No. 32. (Jack 165-6). Fig. 62. long-boiler type. midfeather firebox. adjustable top to blastpipe. Fig. 63 drawing. Fig. 64 photo taken June 1859 on South Staffordshire Railway. Rutherford (Backtrack, 2006, 20, 626) noted that Sphynx had been constructed for the MSLR, but was tested between Longsight and Crewe when it hauled 101 wagons weighing 597 tons at an average speed of 13.7 mile/h. Daniel Kinnear Clark included a plate of this locomotive. Conversion to saddle tanks: only two by McConnell, but many by Ramsbottom. Used for Merthyr & Abergavenny line, 1 in 30 Springs Branch and 1 in 40 Coalport branches. Some of the saddle tanks had 'long centres' and worked greater loads on Merthyr & Abergavenny line. Fig 67 shows ADR No. 6 Lady Tredegar (0-6-0ST) and No. 2 Lord Tredegar. The ADR was a final destination for several of the 0-6-0STs. 244 to ADR as No. 4 Rhondda and then via C.D. Phillips to South Hetton Colliery? Photographic illus. : Fig. 72: No. 1824 (ex 270) rebuilt but still with rubber springs on tender at Bushbury in 1877. Fig. 73 1965 (ex 273) at Crewe in November 1881. Fig. 74: 1850 (ex 275) at Bushbury in 1877, and Fig. 75 No. 1905 (ex 280) at Bushbury in 1877. See also Locomotive Mag., 1924, 30, 64. for photographb of No. 1824 and description of origin, rebuilding and disposal of this type..
Sharp Bros. 2-2-2 expess passenger engines, 1851-3. Nos. 247-256, 287-296. Included indentation of boiler over cranks to achieve low centre of gravity and was identical, according to Jack, to another patent of W. Stubbs & J.I. Grylls of Llanelly (1846). The design incorporated a very large firebox (drawings shown in Figs. 78 & 79); Coleman's rubber springs and buffers (KPJ: Coleman is not a name known to him, but is presumably a patentee). Contemporary accounts claimed that class would be capable of running Euston to Birmingham in two hours: see for instance, Sekon: Evolution of the steam locomotive page 164..
Dewhurst (1950) considered them to be "decidedly freaky" and "It appears inexplicable why McConnell whose machinery and running gear was ususally so straightforward came to produce this potentially troublesome example". Jack responded: "These difficulties vanish when it is realised that the straightforward designs were not his. The Bloomer was simply the Bury single enlarged under Beyer's direction with only minimal involvement by McConnell in firebox." On 22 December 1857 No. 43 (former No. 304) was observed in coal combustion tests by Alexander Lyman Holley and Zerah Colburn but Jack does not state where reported, but probably Ottley 2044. Fig. 82: Ambrotype taken in 1861/2 of No. 47 (former 305) (fitted with rubber springs). Description contained in William Johnston Imperial Cyclopaedia of Machinery. 1855. Locomotive not actually built. C.F. du Nord No. 164 Eugénie. Locomotive built by Fairbairn for Paris Exhibition of 1855 and acquired by CF du Nord. Fig 145 (page 299) on trials in 1855. Wolverton 0-4-2 goods engines, 1853-5. Nos. 28, 124, 148, 164, 192-5, 231, 236. Built in part from parts in stock at Wolverton: incorporated bar frames. No. 193 was sent to York, Newcastle & Berwick Railway in January/February 1854 to work coke trains from Durham to Southern Division. No. 1171 (ex 195) sold to William Moss of Stafford. Phot. of No. 236 in 1856/62. Drawing of No. 231 at Northampton Castle? in 1870s. Hawthorn and Vulcan Foundry 2-2-2 passenger engines, 1854. Nos. 310-320. Wolverton 2-2-2 passenger engines, 1857-61. Classes C, E and K. Nos. 2, 3, 7, 21, 66, 103, 117, 140, 165, 168, 180, 189, 238, 240, 317, 377-381. Fig. 87 No. 103 Class C: rubber springs on tender and carrying wheel axles. 1857/62. No. 980 worked throughout from Euston to Manchester on 5 January 1863. These locomotives from Stothert, Slaughter & Co. failed to conform to specification. Some "authorities" described these as being long-boiler type but Jack states that this was not so. Drawing of No. 321 in Loco. Mag., 1898, May, but this was based on a very rough sketch. Full dimensions have not survived. Class was probably not very successful. Loco. Mag. 1911, p. 113 states that locomotives sent to South Staffordshire line [KPJ firebox to rear of trar coupled axle]. Kitson, Thompson & Hewitson 0-6-0 goods engines, 1854. Nos. 332-242. Fig. 93: Jack noted "modern in appearance". This picture is far better reproduced in British Rly J.
Watford Tunnel North End in 1866: an insight into railway signalling and operating practices in the 1860s. Richard D. Foster. Br Rly J., 1, 284-9. Article built around centre spread illustration of signal cabin taken following a collision of two freight locomotives (Trevithick 2-4-0 No. 89 and McConnell 0-6-0) on 21 May 1866 hauling excursion trains at the Whitsun holiday. Includes reference to the accident report by Col. Yolland. Fig. 97 No. 1073 as rebuilt by Webb at Crewe in 1874. See Jack pp. 212-24 and short Rly Mag. article: 29 locomotives acquired. Line ran from Dudley to Wichnor Junction on the Midland Railway. The Locomotive Superintendent was George Wells who had come from Wolverton. From 1 August 1850 the line was leased for 21 years by John Robinson McClean, the Engineer to the SSR. Cites G.P.Neele's Railway reminiscences (1904 Ottley 6348). From 21 January the line in effect became a branch line of the LNWR. F. Holt made experiments with a form of counter pressure/steam brake on either an 0-6-0 or an 0-4-2 in 1855 or 1856: see Carling's paper on counter pressure braking in Trans. Newcomen Soc., 55 10 and discussion on Proc. Instn Mech Engrs paper by Siemens..
Robinson, E.E. The Souh Staffordshire Railway and its locomotives. Rly Mag., 1935, 77, 162-5. Tables of locomotive stock, its names and dates built, locomotives delivered after absorption by LNWR, and subsequent fate under LNWR (including three converted to tank engines). Similar to Shrewsbury & Birmingham Railway Vulcan. No. 3 broke its leading axle at Sudbury on 29 June 1858. The boiler of No. 1 exploded on 30 May 1864 at Overton on the Peterborough branch. No. 9 sold to Richard Evans & Co, Haydock Colliery. Probably became No. 4 Newton thereat. Locomotives similar to MS&LR 37/39-43 also built by W.J. & J. Garforth of Dukinfield. The names were No. 10 Belvidere and No. 11 Angerstein which reflected McClean's Kentish connections according to Jack. Long-boiler. Originally ordered C&HR. N0s 12 Pelsall and 13 Alrewas. No. 12 was sold to the Wrexham Mold & Connah's Quay Railway on 10 February 1879 and became their No. 7. Was rebuilt as an 0-6-2ST in 1882; and as a 2-6-0T in 1901, becoming GCR 400B. No. 13 went to Barker, Walker & Co., Eastwood, Nottingham. Fig 99: No. 14 Sylph. No. 14 was sold to the Northampton & Banbury Junction Railway in March 1873. No. 15 was sold to the contractors, Scott & Edwards in August 1873 and possible became Lady Cornewall. Hired to Golden Valley Railway in about 1877. Later worked on Nottingham Suburban Railway. E.B. Wilson 0-6-0 goods engines (SSR Nos. 16, 17) Nos. 301, 302. (Jack 220). Viper and Stag. Fig. 100 Viper. Disposal uncertain, but Jack postulates that No. 1166 may have been sold to Grand Tunk Railway of Canada in 1864. 1170 may have gone to Eckersley & Bayliss, contractors for the Rowsley and Buxton extension of the MR.
E.B. Wilson 2-4-0 passenger engines (SSR Nos. 18, 19) Nos. 160, 181. (Jack 220). Vulcan Foundry 0-6-0 goods engines (SSR Nos. 20, 21) Nos. 305, 306. (Jack 221). Priam and Ajax: Fig 102 Ajax. Originally ordered by Thomas Brassey as lessee of the Shrewsbury & Hereford Railway. 21 (by then 1227) was sold to the Northampton & Banbury Railway in 1872. Bilston and Derby. Fig. 103. The original order was for four locomotives. Two were supplied to Oppeln-Tarnowitzer Eisenbahn in Prussia. Beyer 28 (an 0-4-2ST) was similar and became Cannock Chase Railway McClean where it survived until 1955. The Southern Division was extended northwards to Stafford on 16 January 1860 and this led to the transfer of 34 locomotives. Originally ordered for Danuble & Black Sea Railway. Similar to DX class. Became 133 Ostrich and 199 Castor. Figs. 106 and 107: latter former 321 on Tyneside in 1890s. Became 1180/1 in December 1871, having been on duplicate list. 1180 was sold in July 1884 and became Rhondda & Swansea Bay Railway No. 2. It was then sold several times during the 1890s, eventually becoming either No. 11 of the Backworth Coal Co or Cramlington Coal Co., in which case it was scrapped in 1901. Built 1853/4. Fitted with large fireboxes and Dewrance safety valves. Fig. 110 (drawing). Ex-SD 353 converted to 2-4-0T No. 953 at Walsall shed c1882. Fig 113 ex-346 as 2-4-0ST No. 946 at Monument Lane engine shed in 1877. Wolverton 0-4-2 tank engines, 1860. Nos. 102, 110, 125, 174, 354. Fig. 114: photo Hinkley Station c1865. Class also used in London area. 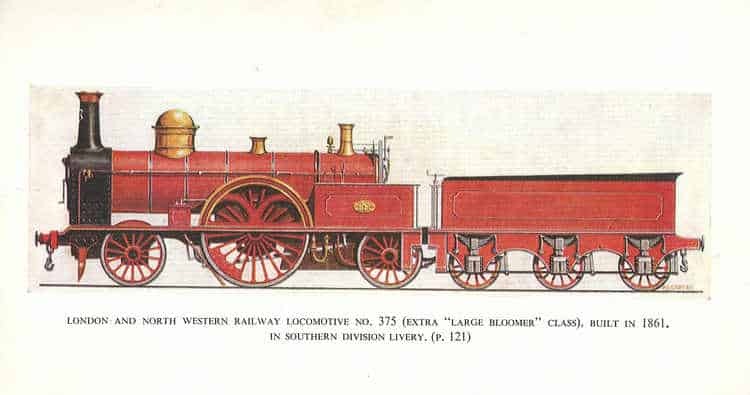 Wolverton 2-2-2 passenger engines  special larger Bloomers, 1861, Nos. 372, 373. 375. Fig 115 (p. 234) drawing. Fig 116 No. 373 at Wolverton in December 1861: International Exhibition locomotive. The pistons were made from wrought iron which according to Jack were covered by a McConnell patent. The valve gear was Stephenson, not Gooch. An enormous firebox was fitted with two grates, similar to Fairbairn's Lancashire boiler. Described in Engineer, 1862, June. 150 psi boiler pressure was adopted by McConnell from 1860. Giffard injectors were obtained from Sharp and weldless steel tyres from Krupp in Essen. In spite of McConnell's departure No. 373 was exhibited at the International Exhibition in South Kensington. Jack quotes W.L. Steel History of the London & North Western Railway (1914) p. 183 concerning the livery of No. 373 when exhibited, stating that Lady of the Lake was painted blue at the Crystal Palace Exhibition of 1851, but was painted green at the 1862 Imperial Exhibition of 1862, whilst No. 373 was painted blue. Jack considers at length the famous "Trent special" which conveyed despatches via the Queen's Messenger from Washington (USA) via Holyhead to London on 7 January 1872. No. 372 was used between Stafford and Euston and according to the Locomotive (1905, May) achieved an average speed of 57.2 mile/h and nearly 80 mile/h was reached between Tring and Boxmoor. Jack cites The Times statement that the Holyhead to Euston time was 5 hours 43 minutes. Problem class Watt was used from Holyhead to Stafford. Jack quotes the absurd sketch of "No. 373" made by Stretton but did not tell us where to find it and an "F. Moore" painting in the Science Museum with No. 373 in a "mythical scarlet livery". Wolverton, Sharp and Kitson 2-2-2 passenger engines, 1861-2. Nos. 389-408. Under Ramsbotton and Webb new boilers were fitted. Backhead injectors were also fitted and the engines were given names.Theye were the main motive power on the Southern Division and could attain speeds slightly in excess of 70 mile/h. In 1890, after the demise of the class both the English Mechanic and the Railway Herald stated that some Bloomers were still working. Even The Engineer could write in 1897: "Bloomers... are even now in use, though their comparatively light weight precludes them from express work". Webb used the cylinder and V-shaped valve layout in Jumbos. Ramsbottom borrowed from it for his 2-4-0 Ironclad design for the South Eastern Railway. A 2-4-0T design appeared in 1876. This was built in quantity until 1898 and the last of these ran until 1955. Thus the Bury>McConnell>Webb design lasted almost until the end of steam. A working replica (No. 670) was produced under the direction of Robert Meanley and uses a Babcock Energy boiler. Wolverton 0-4-2 tank engines, 1862. Nos. 736, 976, 982-988. Domeless boilers, inside cylinders. Gooch valve gear. Nine carried Southern Division numbers. Fig. 129: No. 734 at Sutton Coldfield in 1863; Fig. 130: No. 1857 (ex 983) at Bushbury in 1877 on LNWR rails of LNWR/GWR gauntletted track; Fig. 131: No. 1811 (ex 734) rebuilt with Crewe boiler at Bushbury in 1877. Wolverton 0-4-2 mixed traffic engines, 1862. Nos. 601, 606, 616, 688, 695, 696, 741, 778, 784-787, 790, 811, 1019, 1020, 1021. Nos. 601, 688, 695 and 1021 were converted to saddle tank engines. Fig. 132: 601 at Monument Lane shed within period 1863-9. Fig 133/4 No. 778, former at Wolverton in 1862. LNWR Southern Division 0-4-2 No. 601. Br. Rly J., 1995, 6, 213. In 1852 there were two reports on identifying locomotive classes by number (1 to 51): excluded Nasmyth singles, Bloomers, Patents and Fairbairn 0-6-0s. Another clasification was based on the letters A to N.
Figs. 138/9: four-wheel tender (tank number 5) at Longcliffe in September 1962. Edward Bury: green with black boiler bands. Number on chimney front and an oval brass plate on boiler barrel. McConnell: Number on chimney front, also painted numerals. c1848 on boiler side and various brass plates. Green described as Brunswick green, light Brunswick green and bright green similar to preserved GNR locomotives. Buffer planks were green. From the end of 1860 some were painted very dark red  Foulger's metallic oxide. There is no truth in the statement that some locomotives were painted vermillion: "There is no foundation at all for the widespread belief that engines were painted vermilion. This description first appeared in the Locomotive Magazine of 1898 but seems to have been a mistake on the part of the editor when replying to a note about McConnell livery from the English Mechanic. Questers after a vermillion Bloomer will find one as Fig. 180 in Nock's The dawn of world railways, 1800-1850. 1972. According to Jack locomotives remained green under Ramsbottom, but were painted black from 1873 under Webb. Shallow ashpans had to be fitted to cope with watertroughs (first installed on SD at Castlethorpe, just north of Wolverton in July 1862); front handrails (Ramsbottom); blower pipes moved to standard Crewe position; chimneys replaced by standard Crewe type; weatherboards were fitted and a few SD locomotives were fitted with Crewe cabs; Ramsbottom displacement lubricators anf srew reversers were fitted, but many SD locomotives retained their original safety valves. Buffers and smokeboxes were also replaced. Locomotive Committee Report of June 1852. This was a very detailed survey and for each type gave average number of miles worked, loads, coke consumption and repair costs. Only the 18inch cylinder 0-6-0s managed to haul loads approaching 200 tons. The 16inch 0-6-0s managed about 150 tons and the 15inch 0-6-0 and four-coupled could just exceed 100 tons. The remainder hauled very light loads. According to Lowe Edge Hill Works were established in about 1839. The railway had three locomotive superintendents: the inventive Thomas Melling from 1837 to 1839, William Buddicom from 1839 to 1841 (better known in France) and Francis Trevithick from 1841 who founded Crewe Works, but eventually failed to satisfy the LNWR Board. Lowe noted that ten 2-2-2 were supplied to the Grand Junction Railway by Sharp Roberts in 1837, beginning what was to becaome a standard Sharp product of which a total (not for the GJR) of 600 were constructed. The Crewe type (see below) was developed at Edge Hill under Locke and Buddicom to obviate the crank axle problem which was endemic with the Patentee type; Aeolus was probably the first of this modified type, but there is little solid evidence for its appearance. Tartarus and Sunbeam appear to have been further stages in the evolution of the Crewe type. Francis Trevithick was the founder of Crewe and its locomotive works and had formerly been with the Grand Junction Railway at its works in Edge Hill from 1 September 1841. He was sacked from being Locomotive Superintendent of the Northern Division in 1857 and replaced by John Ramsbottom who in 1862 took responsibility for all LNWR locomotive policy. At present there is no comparable work to that of Jack's on the Southern Division, but Trevithick was as conservative as McConnell was adventurous. Stuart and Reed (Loco Profile No. 15) have sought to show how what has become to be known as the "Crewe type" was developed at Edge Hill under Buddicom and that Alexander Allan's involvement was certainly insufficient to warrant the notion of an "Allan type", a term widely used by authors like Nock (Premier Line). The type was characterized by outside cylinders fixed firmly between two frames in an endeavour to reduce crank axle failures which were endemic in locomotives with inside cylinders at that time. Stuart & Reed note that "The term [Crewe type] is a misnomer, but no such blunder as the alternative 'Allan type'. Crewe works did not originate the design, though development was done there from 1843 to 1857. Alexander Allan (1809-91), foreman of the works, was credited as designer in D. K. Clark's Railway Machinery published in 1855, by which time Allan had left Crewe and the LNWR under a cloud. Allan himself was the only other claimant on his behalf, 42 years after the origins, in a letter to the Crewe Guardian published on October 17, 1882, and reprinted in The Engineer, May 25, 1883. Generations of editors, authors and enthusiasts have since taken this letter as 'gospel'; contemporary official and other records of 1840-57 exclude it even from the Apocrypha. The 'Crewe type' was an outside-cylinder 2-2-2 or 2-4-0 with inside iron-plate main frames extending the full length of the locomotive, and carrying the driving and coupled axleboxes; a supplementary outside ironplate frame took the one (2-4-0) or two (2-2-2) carrying axleboxes on each side. The sloping cylinders were pitched between inside and outside frames and were secured to both. The type was not developed at Crewe beyond those wheel arrangements, though 2-4-0T and 2-4-0ST were produced, most of them rebuilds from tender engines. Other railways and builders (particularly the Highland, Jones & Potts and the Canada Works at Birkenhead) developed the principle into 4-4-0, 4-4-0T, 2-2-2T and 2-2-2WT; and it is believed that an 0-6-0 may have been built in France." Nock, O.S. Historical steam locomotives. 1959. Chapter 3: The "Columbine" and the "Cornwall"
Ahrons British steam railway locomotive Fig. 75 page 74 shows Cornwall as built as exhbited at the 1851 Exhibition as a 2-2-2-2, but notes that Rly Gazette 5 July 1918 showed it as a 2-2-2.. There is a piece in Locomotive Mag., 1897, 2, 174-5 which claimed to show it in original condition (unfortunately KPJ fgailed to note wheel configuation. The driving wheel was vast  on a Great Western broad gauge scale!